The construction industry has made great progress over the last few years to re-engineer products, making them more user friendly and to reduce the risk of long term injury brought about through improper and/or repetitive manual handling. These lightweight, environmentally-friendly recycled polymer composite kerbstones will help all specifiers and contractors to comply with Government aims of building a sustainable future. More importantly, it will enable contractors to continue to lay kerbstones exactly as they have done for generations, but in a quicker and safer fashion. 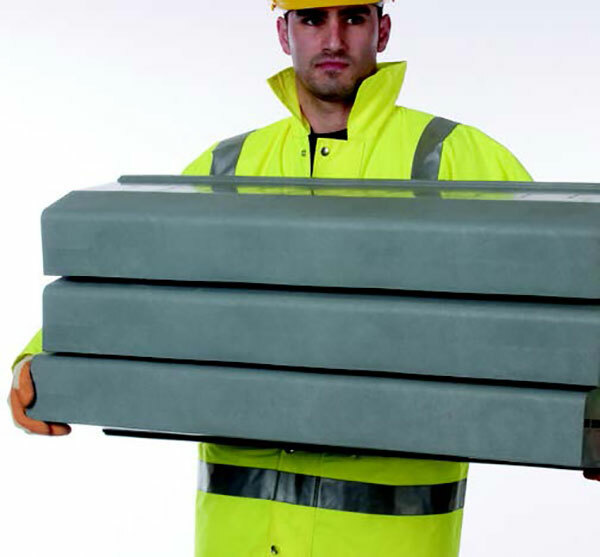 They comply with Health & Safety guidelines concerning the manual handling of kerbstones. A standard HB2 kerb weighs under 6kg, compared to its concrete equivalent of 67kg and the Health and Safety limit of 20kg for manually handled kerbstones. They also match the aesthetic appearance of concrete kerbstones and can also assist Local Authorities in achieving Agenda 21 targets. This focuses on economic, social and environmental agendas, and aims to develop solutions to problems through encouraging better, more efficient practices, with particular reference to sustainability. Its lightweight design enables operatives to quickly position and lay the kerbs. Trials indicate lay rates up to 4 times faster. Being so light makes them extremely easy to store and transport without the use of heavy goods vehicles. Removing the need for mechanical handling equipment, speeds up lay rates and vastly reduces the working space required. The obvious solution where the health and safety risk assessment does not permit the use of handling equipment; for example, where there is an uneven surface or where the risk of traffic accidents is too high. Mitigates against repetitive strain injury. Resistant to the typical chemicals and road salts used in highway construction and maintenance. Helps achieve compliance with ISO 14001 and the objectives of the Egan report. The use of reprocessed material supports government efforts to increase the volume of recycled materials used in a sustainable manner in the construction industry namely, The Government’s Sustainable Buildings Task Force. Redundant kerb can be recycled. 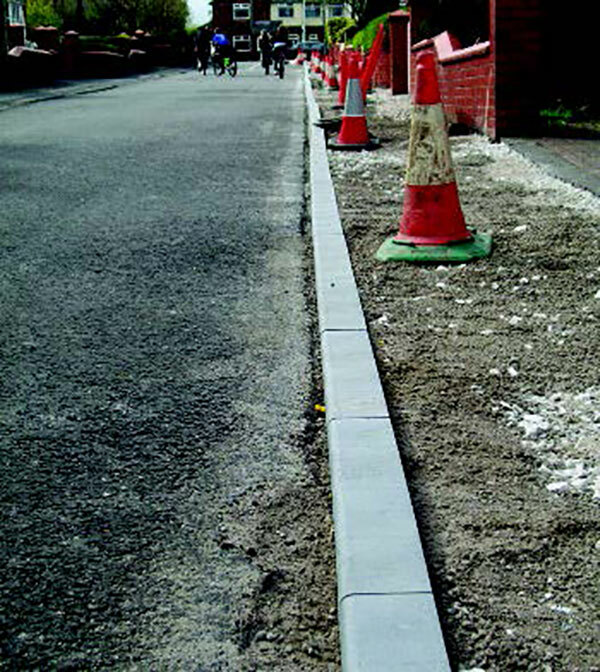 Can be installed exactly as traditional concrete kerbs have been for decades but quicker and safer. No retraining of kerbing operatives is required. The product can be cut with hand tools making less noise and dust than with the concrete equivalent and the kerb is easily knocked down to level. Installers’ exposure to Dermatitis and other skin disorders through concrete handling are removed. The interlocking feature ensures 100% alignment every time. A semi dry mixed concrete of 10mm aggregate for the bed/race, the latter having a slump of 50mm (ST1 / BS 8500), is required. For the hauching/backing the material is to have a 20/30mm slump. The string line is to be set up on pins and set to correct level. The concrete is to be placed along the intended line behind the string. The concrete should then be spread and struck level with a shovel, leaving no high or low points. Check that the minimum specified thickness of concrete at least is under the struck concrete surface. The Kerb is then to be taken from the pallet or truck and placed on the concrete bed, laying from the left offering it to the string line. This is done from the verge/footway side, holding the Kerb with both hands. It is then to be adjusted into position using a small rubber hand maul. With a hand on the top, the surface is then to be tapped into position until flush with the string line. The second unit is then introduced by offering it to the string line at the end of the first Kerb. Ensure that the male alignment spigot on the end face of laid kerb is located within in the female slot of the kerb being laid. The Kerb has a 2.5mm lug integrated into the side face to reduce contact between kerbs, which in turn facilitates the reduction of spalled kerbs during installation. The laying process is then repeated, checking that the first Kerb has not been disturbed, adjusting as necessary with the rubber maul. 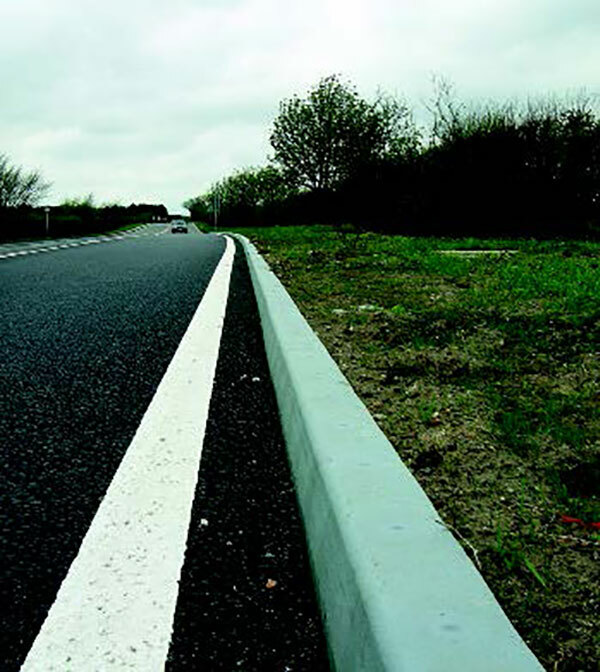 Successive Kerb units can then be added to the line. 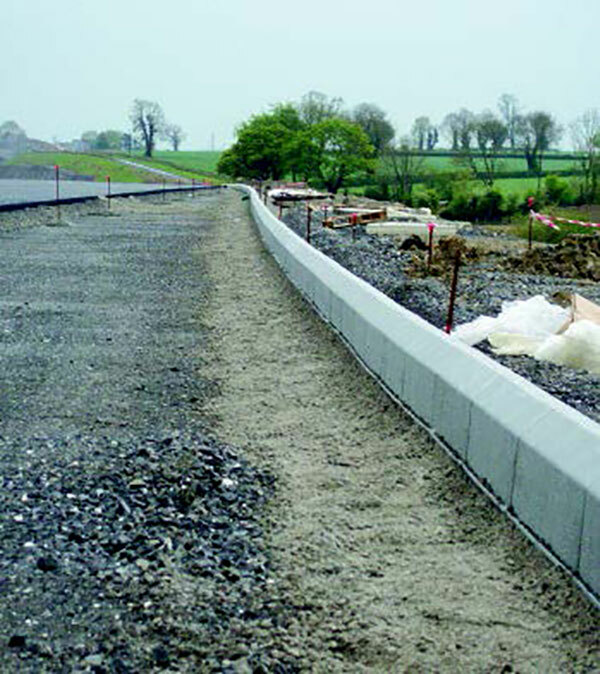 On completion of the kerb line, backing concrete is to be run out from the shute behind the Kerb, covering the lateral flange, keying the Kerb to the haunching and race. The kerb layer then faces off the front of the kerb race, trimming flush to the front flange of the Kerb. The rest of the haunching should be trowelled into shape and then the line of the kerb should be checked again for accuracy.